By breaking the link between the utility's sales and profits, decoupling creates an incentive for utilities to sell less energy and focus on energy efficiency. The revenues and profits of most utilities are still based on how much electricity they sell, rather than on the quality, reliability and efficiency of service they provide. As a result, utilities have had little incentive to meet consumer quality expectations, improve reliability, or create new kinds of innovative products and services like those found in all other service sectors. Most investor-owned utilities create shareholder value every time they make capital investments, regardless of the value of that investment to society or in the market. In other words: utilities build it, rate base it, and get a regulated return on it. Regulators authorized this system under the assumption that grid directly and indirectly powers the economy, keeping rates aligned with sales. Power companies have been reluctant to invest in technologies that will reduce consumption of the product they sell, even if there are other benefits. One way to realign the public interest with that of the utilities is through a process called “decoupling” which breaks the direct relationship between electricity sales and profits. Decoupling has been successfully employed in California. 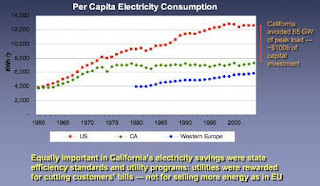 Largely due to the proper incentives, energy use per person has remained largely flat over the past 30 years in California, but it has increased by roughly 50% for the rest of America. Historically, utility regulators have set electric and gas rates based on projected sales volume. Since this also sets a utility’s revenues, it is a disincentive for them to promote efficiency or to make it easy for customers to install on-site generation. “Decoupling” breaks the linkage between the amount of electricity or gas a utility sells and its ability to generate profits. This approach has the potential to enable utilities to remain profitable while investing in improved efficiency and reliability. Some states let utilities keep a small part of what they save for their customers as extra profit. This fully aligns utilities with customers’ incentives and can strongly motivate utilities to help customers use electricity more efficiently. Decoupling - Disassociation of a utility’s profits from its energy sales. - Here, one determines during a normal rate case how much revenue a utility requires to cover its expenses and sets an electric rate which is expected to produce that level. Later, perhaps at the end of a year, we return to see whether, in fact, that revenue has been generated or whether, due to fluctuations in sales from the expected level, some greater or lesser amount has been realized. ;To the extent that the utility has, in fact, received too little (too much) the error is correct through a surcharge (rebate). DER – Distributed Energy Resource - Including energy efficiency, load management and on-site electricity generation. Customers who generate their own electricity and offset their consumption at retail electricity rates pay lower electricity bills and reduce the amount of electricity revenues collected by the utility. Reduced revenues have a direct impact on all utilities’ recovery of costs associated with each customer, and for regulated utilities, profits. DSM - Demand Side Management - the modification of consumer demand for energy through various methods such as financial incentives and education. Usually, the goal of demand side management is to encourage the consumer to use less energy during peak hours, or to move the time of energy use to off-peak times such as nighttime and weekends. LRA - Lost Revenue Adjustment - An alternative to decoupling - One calculates how many dollars a utility has lost due to its DSM programs and increases revenues by that amount. For example, suppose a utility has a program to replace existing electric motors with more efficient ones, and that it estimates that, as a result, its electricity sales are 100 million kwh lower as a result. If each kilowatt hour produced, say two cents in revenue net of fuel and any other variable costs, then the utility would lose $2 million in net revenue to this program which would be recovered under a lost-base revenue adjustment. Inflation and Productivity Decoupling - The target revenues are adjusted between rates, based on assumed or known changes in inflation and company productivity. Inflation is often based on a recognized government-published index, such as the consumer price index. Productivity is more often litigated in the rate case and serves to offset inflation over time. IOU – Investor Owned Utility - Privately owned, they represent 60% of the total number of electric utilities and approximately 42% of generation, and 66% of sales in the United States. Like all private businesses, IOU’s fundamental objective is to produce a profit for their investors. IOU’s are granted service monopolies in certain geographic areas and are obliged to serve all consumers. As franchised monopolies, these utilities are regulated and required to charge reasonable prices, to charge comparable prices to similar classifications of consumers, and to give consumers access to services under similar conditions. Many IOU’s in states that have adopted retail competition have divested their generation and placed their transmission assets under the operational control of independent system operators (ISOs). These IOUs’ primary function is providing distribution service and serving as the supplier of last resort for those retail customers that have not chosen an alternative retail energy service provider. Municipal utilities were established to provide service to their communities and nearby consumers at cost. Municipal utilities typically return a portion of their net income to consumers in the form of a general funds transfer. Retail rates may be lower than neighboring investor-owned utilities because they are not subject to State and Federal income tax. Municipal utilities, as well as other publicly owned utilities, are able to issue low cost, tax exempt debt to finance construction. Most municipal utilities simply distribute power, although some large ones produce and transmit electricity as well. Public utility districts are concentrated in Nebraska, Washington, Oregon, and California. REV - Reforming the Electric Vision - New York is actively spurring clean energy innovation, bringing new investments into the State and improving consumer choice and affordability. In its role, the PSC is aligning markets and the regulatory landscape with the overarching state policy objectives of giving all customers new opportunities for energy savings, local power generation, and enhanced reliability to provide safe, clean, and affordable electric service. The REV initiative will lead to regulatory changes that promote more efficient use of energy, deeper penetration of renewable energy resources such as wind and solar, wider deployment of “distributed” energy resources, such as micro grids, roof-top solar and other on-site power supplies, and storage. It will also promote markets to achieve greater use of advanced energy management products to enhance demand elasticity and efficiencies. These changes, in turn, will empower customers by allowing them more choice in how they manage and consume electric energy. The vision put forth in REV is one in which DERs are the first resource chosen, not the last. RPC - Revenue Per Customer Decoupling - The average revenue per customer for each volumetric rate is computed at the end of the rate case. In subsequent periods, target revenues are derived by multiplying the actual number of customers served by the RPC value. The underlying premise for RPC decoupling is that, between rate cases, a utility’s underlying cost structure is driven primarily by changes in the number of customers served. Rates –in a decoupled scenario, rates are set to recover the pre-determined revenue requirement and rate options are usually set to be revenue-neutral. Rates vary by service voltage. Stranded Assets - Assets that have suffered from unanticipated or premature write-downs, devaluations or conversion to liabilities. In discussions of electric power generation deregulation, the related term stranded costs represents the existing investments in infrastructure for the incumbent utility that may become redundant in a competitive environment. Utilities fear that they'll get stuck with billions of dollars in stranded assets. Utility Cooperative - Owned by their members, the consumers they serve. There are 883 cooperatives operating in 47 States, generally in rural areas. Cooperative electric utilities represent about 27% of U.S. electric utilities, 10% of sales, and around 4% of generation. Cooperative service territories generally reflect areas that historically were viewed as unprofitable to service by investor-owned utilities because of the relative low number of customers per line-mile. Cooperatives are required to provide electric service to their members at cost, as that term is defined by the IRS. Electric cooperatives set rates similar to municipal utilities. However, while municipal utilities may return a portion of net income to the general fund of the local government, the net margins earned by cooperatives are considered a contribution of equity by the members that are required to be returned to the members. As a Smart Grid enables more conservation and distributed generation, regulators will have to address the problem of how to provide appropriate rewards to utilities for actions that will reduce total electricity sales. Decoupling makes it cost effective for utilities to invest in smart grid technologies that will reduce consumption of the product they sell. Under decoupling, utilities submit their revenue requirements and estimated sales to regulators. The state PUC sets the rates by regularly applying adjustments to ensure that utilities collect no more and no less than is necessary to run the business and provide a fair return to investors. Any excess revenue gets credited back to customers. Any shortfall gets recovered later from customers. First-mover states such New York, Hawaii, and California, are tackling this problem by investigating how to align utility investments with a more-efficient grid that relies less on peak power from centralized assets, and more on integrating DERs into enhanced planning, grid operations, and market operations. Removes the disincentive for utilities to encourage energy conservation, since their revenues are not tied to the amount of energy sold. Provides an incentive for utilities to focus on effective energy efficiency programs and invest in activities that reduce load and reduce stress on the grid. Aligns shareholder and customer interests to provide for more economically and environmentally efficient resource decisions. Liberal Economics - markets will do a better job of determining value than central planners, which means a cheaper, more efficient power system with less waste and redundancy. Protects Utilities from Externalities - RPC decoupling may inadvertently compensate for revenue changes driven by activities other than energy conservation programs like demand response that regulators would rather not include in the system. For example, reductions in consumption caused by an economic downturn would be compensated for in a decoupling mechanism. Year-to-year reductions in electric sales can be the result of factors other than conservation, notably changes in weather and economic conditions. As a result, adjusting electric rates to make up for reduced sales can shift risks from the companies to ratepayers and provide the companies with a windfall. Negotiated Return Discourages Innovation - Many of today’s utility business models are based upon the utility earning a negotiated return on prudent capital investments. It is not surprising, therefore, that the utilities responsible for making prudent investments focus on minimizing risk. Even with decoupling, utilities are often slow to adopt new technologies that have not been extensively proven outside of a laboratory. In general, the existing utility business model does not provide economic rewards for cutting-edge utilities. Regulated Monopoly Utilities Distort Markets - utilities have every incentive to begrudge competitors, cling to sunk costs, and use access to regulators to keep the game rigged in their favor. As long as a company with a captive set of customers and state-guaranteed returns is participating in energy-service markets, it will distort those markets. If they use their pull with regulators to protect themselves, it will only slow down (and raise the cost of) the clean energy transition. Regulatory Model Discourages Innovation - regulatory model is built for caution. It takes a long time to innovate on technologies that only come in multibillion-dollar increments, and when your returns are guaranteed by law and reliability is your only obligation, you're likely to stick with the tried and true. A state activity report developed by The Edison Foundation, Institute for Electric Efficiency is available here.